Need an honest product review? Want to reach various audiences across a range of social media platforms? The Motherhood is looking to work with like-minded brands who want to buck the trend and try engaging with potential audiences across multi-level social media. Each member of The Motherhood has their own social media channels which are run by them and all linked through to the main Hub, The Motherhood. Acting as an umbrella for all the accounts, The Motherhood will help with social interaction by managing the engagements and working on joint promotions. We are happy to talk to various brands, companies, and individuals who wish to work with us on product reviews, ambassador programmes, sponsored content, infographics, advertorials, and more. The Motherhood is also to happy to work with food-based companies on creating unique recipes for publication on this website, or on others with supporting links. 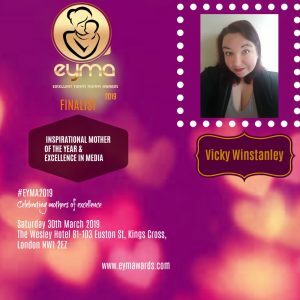 Vicky – is main writer and creator for The Motherhood and has been blogging on a professional level for over seven years (A Cupcake Mum and A Mum Inspired), but writing blogs online in various formats for almost 15 years! In reality, Vicky was working on blogs online before it was cool. Back when she was a teenager, Vicky created an online magazine about pop music and wrote about her favourite bands. Armed with a camera and a press pass she made herself, she got into every concert that she could for free and managed to rub shoulders with the stars. Vicky had aspirations of becoming a journalist and writing for her own magazine when really, she has done just that in creating The Motherhood. Vicky has a background in marketing and web design and has worked in both the education and public sector before becoming a freelance blogger, writer, and social media consultant. She now works from home and has a small base of clients for which she manages their websites, social media, and online presence, as well as creating marketing materials, such as flyers and wedding brochures. Vicky also photographs events for various PR firms in the North West capturing in the moment action shots of people enjoying themselves. Most recently The Motherhood has worked on projects for BritMums and Mcdonalds, if you look closely you will see us in the summer family fun adverts with Stacey Solomon! We have also worked with brands from Blog On Conference such as Hex Bugs, Slush Puppy, Co-Op Food to name a few. 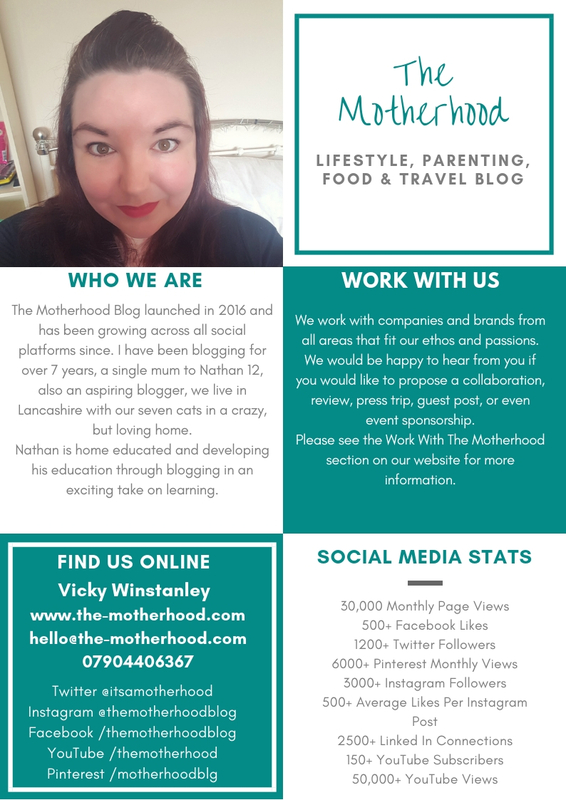 On previous blogs and on The Motherhood, Vicky has worked with brands such as Sainsbury’s, Prezzo, Morrisons, Bluestone Wales, Butlins, Harvest Moon Holidays, Centre Parcs, Total Ninja, Fruit Shoot Mini Mudder, Sage Appliances, Brewers Fayre, Dunelm Mill, Lakeland, Philips, Poundland, Logitech, Chromecast, Emu Australia, Hotter Shoes, BBC Good Food Show, Escape Room Preston, Interplay, Lytham Festival, Ecover, Hard Rock Cafe, Costa, Belvita, St Helens Farm, Collins Books, Yeo Valley to name but a few! Please do not hesitate to get in touch if you require further information or to discuss a project in which you would like to work together on. The Motherhood is a registered business, the work on this website is done as both a hobby and to earn a living. We are one of those lucky families who are able to draw on previous work and life experience and earn a living from blogging and putting our life online. We are more than willing to work with brands of various sizes across the board, but please be aware that for low-value items, there may be rates involved when being asking us to work with your brand or company. However nice a packet of biscuits may be, that packet of biscuits which we have been asked to “do something creative with”, does not pay the bills, especially in a house with children – biscuits really do not last very long, I can promise you! We will always do our best to provide an extensive level of cover across our website and social media channels based on the value of the item in question. If you would like more information, please get in touch for a up to date list of rates or to discuss.